The first practice took place on a wet but drying track surface. Following the wet conditions experienced at Donington Park for British Talent Cup Cameron Horsman showed that he wasn’t afraid of the wet. From the start he consistently improved his lap times as the first free practice progressed finishing with a time of 54.071. By the afternoon and second practice the track was dry and saw Cameron continue to lead the Honda standard class recording the fastest lap at 51.039 and finishing both practice sessions at the top of the time sheet. The track and weather conditions for qualifying on Saturday were good and from the start Horsman was up at the front pushing hard, enjoying the Indy Circuit and eventually qualifying in second place with the fastest lap time for the Standard Class of 51.134 behind Victor Rodriguez. The weekend having got off to a good start, as the lights went out for the start of the first race saw Cameron riding hard, enjoying the Indy Circuit, up amongst the Moto 3 riders and battling with Rodriguez and Cook in the standard class. This battle continued throughout the race and saw Cameron taking third place, his first podium of the season and recording the fastest lap at 50.605 / 85.93mph. 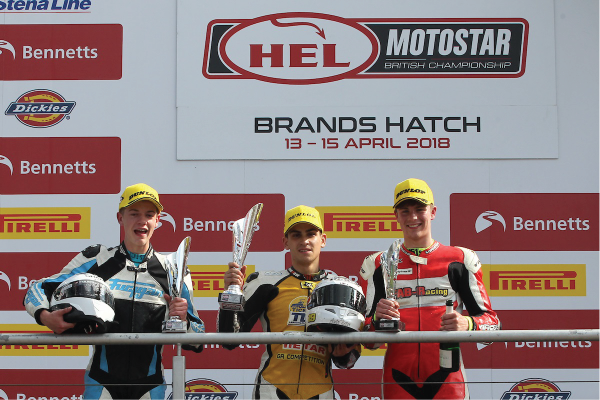 By virtue of Cameron having the fastest lap in race 1 on Saturday meant he started Sunday’s race on pole position in the Honda standard class. As the lights went out Cameron got a tough start and found himself further back than he would have liked. However he made his way back up and being faster than Cook and Seabright, who were in second and third place, it looked as though there could be another podium but on the last lap Horsman was held up and at the flag took fourth place. Following the race Cameron said it had been a good weekend, he was pleased with the results and his bike had performed well. Again thank you to my family and everyone who supports and encourages me but particularly to my father for ensuring my bike is race ready.